1. 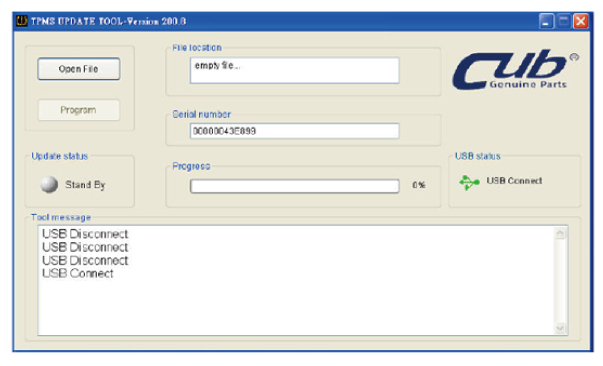 Connect the USB cable from Sensor AID to the PC, Click on the CUB TPMS update icon to start the program. 2. The following screen appears, When you see USB connected, Click open file to select the newest update file you download from the web or the newest CD you obtain. 3. Click program after the file is selected to start the update process. 4. The update process should look like the following window, the update status light will flash yellow light during the update. NOTE: Every device has it's unique license number, the software must match the license number to update.